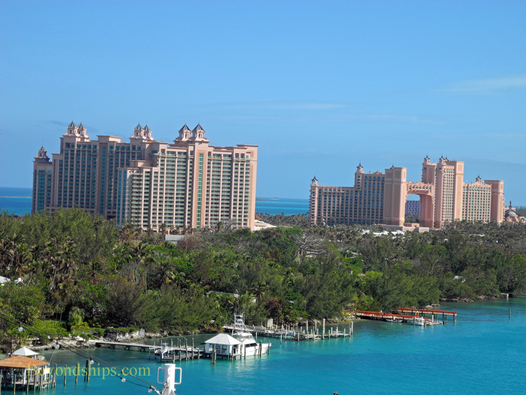 The Atlantis Resort on Paradise Island dominates Nassau. You can see the towers of the hotel from miles out to sea as you approach the port and they are the most prominent features of the landscape when you are docked in Nassau. In addition, Atlantis is the largest private employer in the Nassau area. For many, the opportunity to visit Atlantis is the reason for coming to Nassau. In addition to the hotel, the resort has a casino, spa, nightclub, restaurants and bars. It has beaches, pools and a water park. The grounds are landscaped like a tropical paradise with sculptured out buildings, canals and lakes. Some of these waterways are home to numerous types of marine life which you can observe through the massive windows of the resort's own aquarium. Running as a theme through the resort is the legend of Atlantis - - the advanced civilization that the ancient Greeks tell us sank into the ocean during a natural catastrophe. The resort is styled as the site of the lost city with the architecture of the buildings reflecting the designers' vision of what Atlantis would have looked like. There is even an archeological dig with ancient buildings as a backdrop for the aquarium and recovered “artifacts” on display around the resort. Interestingly, one sees people intently reading the academic-sounding descriptions of these artifacts even though it is all the product of someone's imagination. Cruise ships calling in Nassau usually offer shore excursions to Atlantis. While the excursions vary with the cruise lines, these can include such things as dolphin encounters, use of the resort's beaches, use of the Aquaventure water park and slides, tours of the resort and aquarium. It is also possible to visit Atlantis independently. The casino, lobby and marina village (shops) are open to the general public. However, the resort limits access to some areas. Day passes can be purchased for the beach, the Aquaventure, the dolphin encounter and the aquarium/dig. (Some passes do sell out). Cruisers can take a taxi to the resort from the cruise terminal or the water shuttle between Nassau and Paradise Island.